I know what you’re thinking. You’re thinking…”Squash…again?” Heck yeah. It’s the time of the year where my CSA bin is inundated with squash. It’s unstoppable. You can’t stop it. You just have to embrace it, find new ways to eat it, and then enjoy the fruits of your labor. In this case…that’s exactly what I did. This is the second time my CSA bin has thrown delicata squash my direction. I copped out last time and chopped it, steamed it, then threw it on a broccoli crust pizza. But this time…I really wanted to experience the delicata squash. So, I went hunting on Pinterest (because…hello!) and happened across a recipe originally posted on the blog Peanut Butter & Peppers, which focuses on health, fitness, and good food. As delicata squash was not something that came up a lot on Pinterest…and I had the squash and goat cheese…I figured I could at least wrangle up a pomegranate (or 2…because I love pomegranate) and give this recipe a try. Tonight…was that night. And below…is said recipe. Wash delicata squash, cut off the ends. Slice squash in 1/2″ pieces. With a spoon take the seeds out. Place the squash in a bowl and toss with olive oil, cinnamon, salt, and cayenne pepper. Place squash on the prepared baking sheet. Bake for 10 minutes, flip the squash and bake for another 10 – 12 minutes or until fork tender and skin slightly blistering. 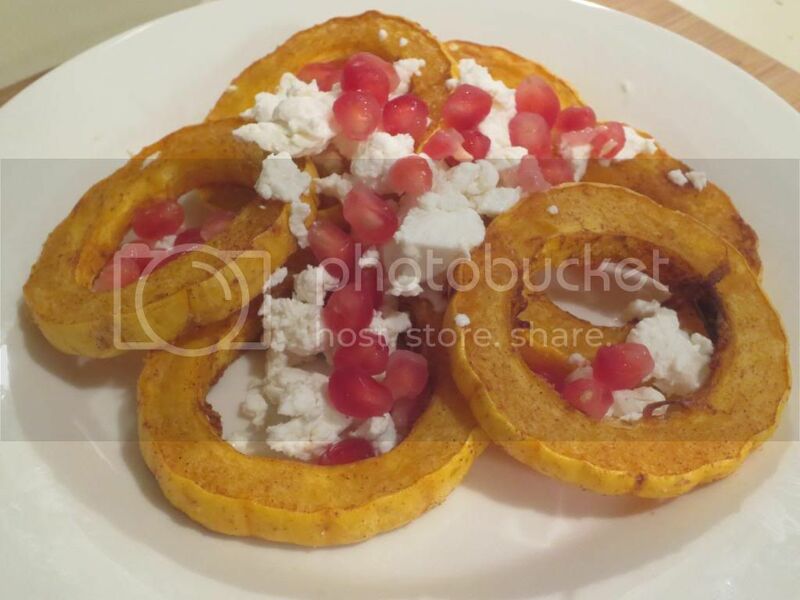 Place squash on a plate and top with pomegranate arils and goat cheese. This dish is a flavor explosion. You have the sweet creaminess of the roasted winter squash. Then you have the sweet tang of the pomegranate arils. And then that savory, rich flavor of the goat cheese. The cinnamon and cayenne pepper give it this nice warmth (not heat, but warmth)…with just the right amount of sweetness. It all balances out and comes together right on the plate. As I was eating, the only fault I could find was that there wasn’t more of it. This is a fantastic dish…and very nutritious too. Clean eating, once again, for the win!! I’m sure any winter squash would be a good stand in, but the delicata squash made for a beautiful, and more importantly, delicious plate. This entry was posted in Cheese, Clean Eating, Entree, Food, Gluten-Free, Recipe, Side Dish, Squash, Vegetables, Vegetarian by The Celiathlete. Bookmark the permalink. Yum! This looks delicious! I love pomegranate and goat cheese together and I can imagine how it is with the squash!